Moist, apple cake topped with lightly spiced buttery, creamy cream cheese frosting. What's not to love? I can't decide whether to eat this cake with a cup of coffee at breakfast or after a hearty cold weather dinner. Then again, why not make this as an after dinner dessert and then revisit it the next morning for breakfast? This is the second apple cake I've baked this season and although the Applesauce Cake I made back in September was good, I liked this one even more. This recipe was covered back in October on Smitten Kitchen and I'm so happy that a coworker introduced me to this blog. The photography and the recipes are great... go check it out! Check out this cake, too. It's easy to make and I promise it will put a smile on your face. Preheat oven to 350°F with rack in middle. Spray an 8 or 9 inch square pan with cooking spray and line with parchment paper. Make cake: Whisk together flour, baking powder, baking soda, salt, and spices. Beat butter, brown sugar, and vanilla with an electric mixer at high speed until pale and fluffy, 2 to 3 minutes. Add eggs one at a time, beating well after each addition, then beat in applesauce. At low speed, mix in flour mixture until just combined. The batter will be very thick. Make frosting: Beat cream cheese, butter, and vanilla with an electric mixer at high speed until fluffy. Sift confectioners sugar and cinnamon over cream cheese mixture, then beat at medium speed until incorporated. Spread frosting over top of cooled cake. 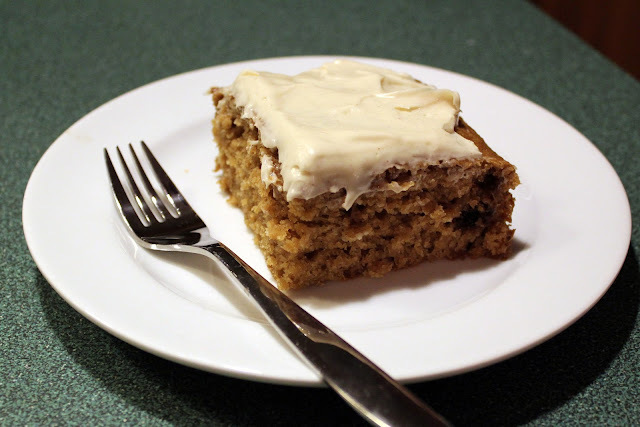 i LOOOOOOOOOVE spice/apple sauce cake.. i bet this was so moist! 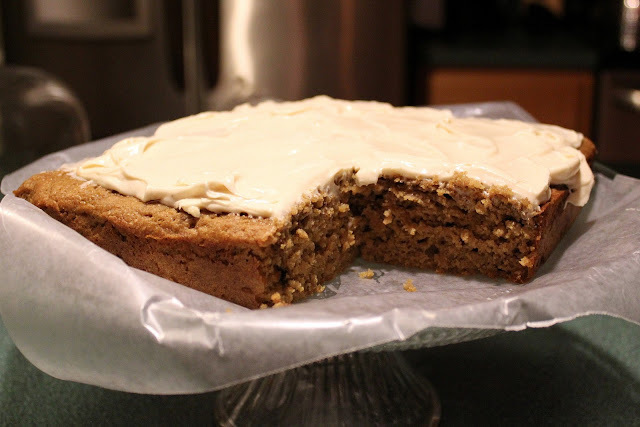 I think I'll make a ginger/spice cake this holiday season. and cream cheese frosting is the best! I could sure use a hunk of that right now! Oh man that looks great! I love a nice moist cake topped with tons of frosting...yum! I love simple snack cakes like this. The cinnamon makes me want to sing! I'd love a piece right now for lunch!